AGM-1217 , 12 V, 17 Ah. Lead Acid / AGM battery. Home > * Emergency Light Battery > AGM-1217 , 12 V, 17 Ah. 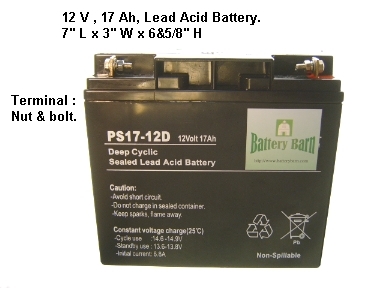 Lead Acid / AGM battery. 12 V, 17 Ah. Lead Acid / AGM battery. Weighted 12.2 pounds . This battery only can be shipped to US zip code address. Sorry! we can't take oversea or Canada order for this battery.